A caramel cup? Oh my! Peanut butter cups are my husbands favorite, but I love anything caramel! Cant wait! Thank you for sharing with us. I think you just made my J bear a happy young fellah. He loves reese cups and yours I would feel much better about him having. Have you tried these without wrappers? Did it work at all? I would love to make mini ones but don’t have the liners….might have to just go for the big ones ;). Yum! 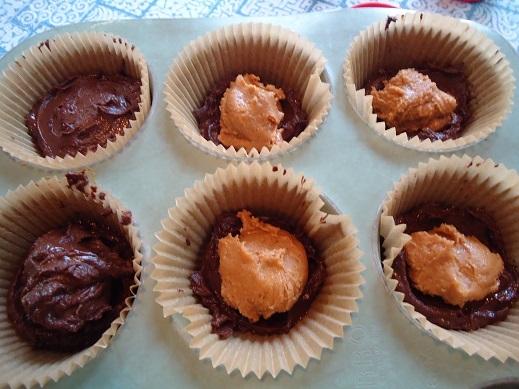 Thanks Laura for posting this….and they look delicious….and I’ll be looking forward to the caramel recipe too :) Keep up the good work, and all of us appreciate all the great recipes you give us…..have a great day….. I was wondering could we use your recipe for chocolate chips for the chocolate part. Would we need to add the butter in that instance? Was thinken if you warmed up the peanut butter it would be easier to spoon/poor in evenly maybe:) Was also wondering if adding a tablespoon or two of cream to the chocolate would make it smoother…or maybe coconut oil? Much less messy with coconut oil. 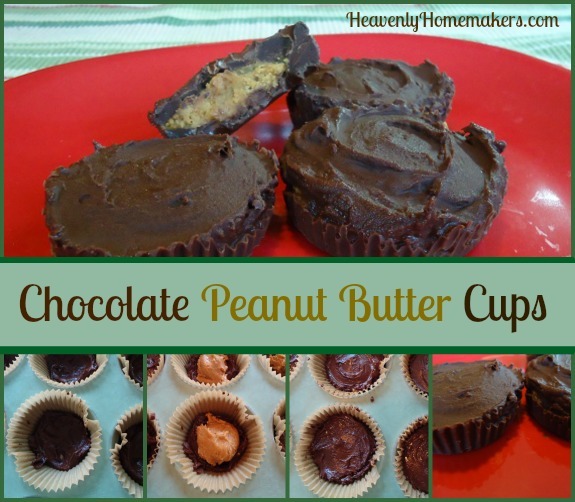 I adore chocolate and peanut butter anything so I will definitely be trying this healthier option. 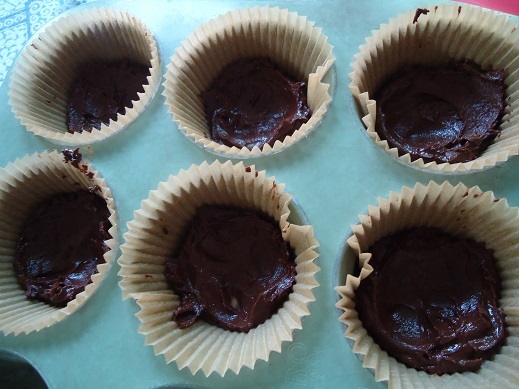 I tried these using leftover baking chocolate (just to use it up) – turned out pretty smooth – I did one at a time so that it wouldn’t harden up on me. I used 2 utensils to make a little peanut butter patty and then scraped it onto the chocolate trying to leave it as flat as possible. These popped right out of silicone baking cups. Thanks for sharing the idea! love it! 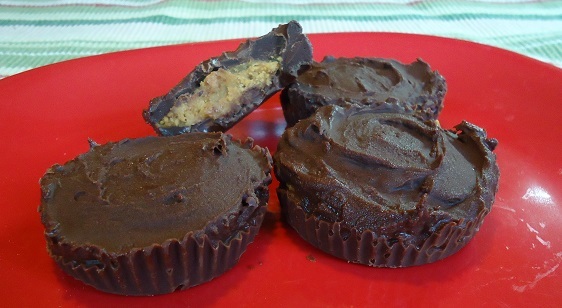 My granddaughter & I made these yesterday, and they were absolutely delicious….my daughter says she thought they were even better than the original reese cups…..
Also made some small heart ones using a Silicone heart pan, and they popped right out after a few mins. leaving them set….as I also had them in the freezer too…. 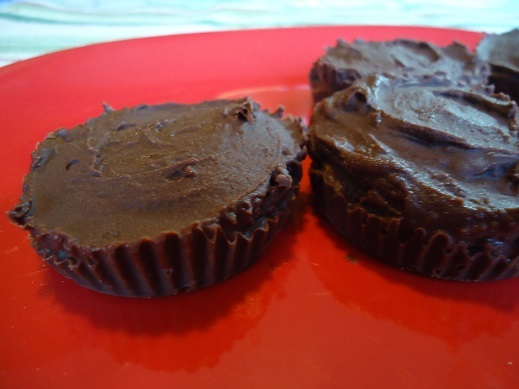 Next will try your chocolate caramel cups….I love caramel, so I imagine I will like these also….. Thank you. I’m looking forward to making these as a gift for my little girl. She absolutely loves Reese Cups! However we are trying to eliminate all the nasties….glad to be able to give her the gift of her Reeses back and know that while there is still sugar It’s not quite so bad. I’m going to use dark chocolate…Doesn’t that make it good for you??? kinda? Can’t wait for the caramel recipe!!!!! I’ve discovered to make the peanut butter have the texture of the ‘store variety’ add graham cracker crumbs! Works great. I warm my peanut butter with a bit of butter and then add graham cracker crumbs (almost equal parts). Press into a greased square pan and then sprinkle with choc. chips and put in warm oven to melt the chips enough to spread. Quick and easy. Thank you so much for this. We’ve made this time after time again. They don’t last longer than 24 hours. They are so good! A little messy in the muffin liner prep; I can’t get them to look good like yours, but so good! !